Aristophanes (ca 446-386 BC), the most famous writer of Old Comedy in Classical Athens, wrote Peace during the Peloponnesian War (the work was first produced in 421 BC). In the play he makes a passionate, lyrical, and nostalgic plea for peace between the warring Greek states. The play is justly famous, not merely for the usual Aristophanic blend of robust humour and vitriolic satire, but also for the way it hearkens back to the rich joys of peaceful agricultural life. 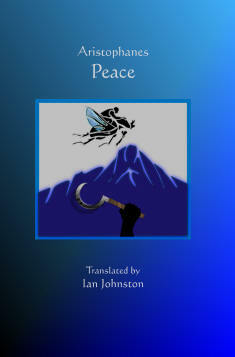 In the play, Trygaeus, a middle-aged Athenian fed up with the war, flies up to heaven on a dung beetle, in order to release the goddess Peace (who has been shut up in a cave by other gods, who are fed up with the way human beings behave). With the help of group of workers from many different states he succeeds in liberating the goddess and bringing peace back to Greece. As is common in Aristophanes, the final celebration has a certain ironic tone, because not all citizens are happy about the end of the warfare (the arms manufacturers and ambitious politicians, for example). Shortly after the first production of the play, the warfare between Athens and Sparta did stop, but, as the sub-text of the play suggests, peace was too fragile to sustain. This new translation provides an accurate and readable text, well suited to dramatic recitation or production. The translator has provided footnotes to assist readers with the many references to contemporary events and characters.